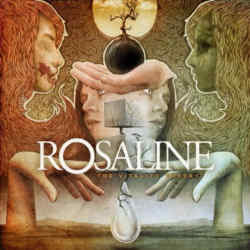 Rosaline are a metalcore band from Chicago that releases new music on a quite regular schedule. After We’re All Just Passing Through (2006) and A Constant North (2009), The Vitality Theory is already the third album by this still young band. Fighting hard not to be called an emo, screamo or postcore band, they still have to live with the fact that these labels make somewhat sense. Not that there is anything bad about that! The Vitality Theory is aimed rather at a younger audience. Starting with the opener The Messenger, emo and metalcore mix violently and should be considered an invitation to headbang. The production is enormously powerful and transparent, which furthermore emphasises the band’s brutality. The following London Lost Its Fog is another fierce track, before Model Ships shows a quieter side with a strangely magical combination of clear and skewed vocals. Rosaline work hard to present a varied record, and even if through the course of eleven songs some ideas may seem familiar, the sextet still knows to surprise. The dark Face Like Thunder contains death metal elements and reminds me a little of Cannibal Corpse. This is followed by the strongly contrasting pop track It’s Just Better For Everyone with sing-along parts that is not unlike Thursday. Repeat After Me! is a cliché free ballad that I wouldn’t have expected in this place. The psycore brigade will have a great time with Neuqua Valley Gunslinger before the subdued instrumental Recovery ends the CD on an astonishingly atmospheric note. Rosaline have proved with their new album that despite its well known ingredients, it’s still possible to come up with new recipes. Even though some elements have been heard before, the way they are put together is definitely new. Thumbs up for this young band that should be kept under close watch!